Drs. Naras Bhat, Kusum Bhat, Anita Bhat, and Jyoti Bhat of Weight Loss Endocrinology provide diabetes treatment and management to residents of Antioch and Concord, California. Diabetes occurs when the regulation of the blood sugar is disrupted. There are three types of diabetes: type 1 or juvenile diabetes, type 2 diabetes, and gestational diabetes. Type 1 diabetes was originally called juvenile diabetes because it typically appeared in childhood or adolescence. The term is now often used to indicate diabetes that requires insulin. Type 2 diabetes occurs when body cells become insulin resistant and is more likely in middle to late adulthood. Gestational diabetes occurs only during pregnancy and is thought to be related to hormone changes. What's the Significance of Insulin? Insulin is a hormone manufactured and released by the pancreas. When people eat, the food is broken down into sugars that are released into the bloodstream. Insulin allows sugar to move into and nourish the cells. Insulin also allows the body to store excess sugar as glycogen and release it when energy demands increase. If insulin levels are too low or the body cells are resistant to its effects, the blood sugar rises, causing damage to all the body cells and organs. One of the difficulties in managing diabetes is the need for “real-time” blood sugar monitoring to know how much insulin is required. 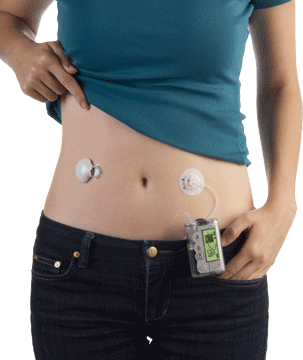 Continuous glucose monitoring (CGM) systems consist of a tiny sensor inserted under the skin to check the sugar levels in the tissues. The sensor can remain in place for about a week and then must be re-implanted. The user can obtain current tissue sugar readings on a wireless monitor. CGM is not quite as accurate as a standard blood glucose monitor and must be double-checked to confirm the readings. The best way to manage diabetes is to constantly monitor the blood sugar and administer insulin to correct any elevations; an insulin pump can help achieve this goal. The pump is a device about the size of a cell phone that contains a cartridge of fast-acting insulin. The pump is programmed to deliver small amounts of insulin through the day and night to keep the blood sugar stable, with an extra dose at meal and snack time. Click here for additional information about diabetes.